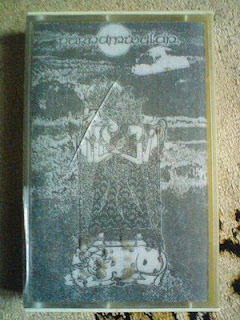 Purnamwulan showed some good promises with their “The Fullmoon Over The Kliwon”, but that is the only release that you could ever hear of them till today. Words has it that there’s an unreleased demo lurking somewhere, not being released due to the bad sound produced. Exactly not in the state of knowing the latest development of the band nowadays, and of course lots have been happening as well (Sanghyang Wulan is no longer the Aavimarga in Hayagriva, etc, etc), here’s the 1997 interview. Purnamwulan, does it mean ‘fullmoon’? Why did you choose this name? Yes, it means fullmoon… It’s very unique and specific to describe… the roots is the main point why I’ve choose this name as the band’s name… the fullmoon has a lot of inspiration to me and of course to all of my band’s line-up… Therefore, the fullmoon is the main roots, so, here I don’t want to take pathetic things to mention towards my band’s name… Purnamwulan gives to us an enlightment and it has a vast meaning of the fullmoon in fifthteen’s night of Friday’s night in Javanese calendar… I sing my songs with my mythologickal lyricks in Kaendranian Heathendoms’ Javanese Kingdom… Purnamwulan are ours!!! “Java Celestial Ethos Metal”. Give us the full description of this particular style of music that you claim your own. In what way does ‘Javanism’ connected with the music and the band? “Java Celestial” came from our mystick and poetick lyrics, narrating about the kingdom of Suralaya and Singhasari in Javanese Deities mythology… It happened in Kaendranian’s epically and historically… and the main point of the most unique life-style of Javanese cult and culture… “Ethos Metal” came from our aggressive, enthusiastic sound and musickal style… containing the vast meaning of art!!! Also have a little connection with Java’s musickal style eventhough there are no traditional Java equipment included… just listen and get an appreciation on our songs!!! Of course, Javanism does connected with our life-style, musick and the band because honestly, we came from this blood-roots!!! You’re also involved in Hayagriva as Aavimarga, Sanghyang Wulan; so made you decide to be in two bands at the same time? What’s the latest news on Hayagriva right now? Both of them is my main bands… I’ve arranged myself into these two bands without any problems because we’re undergoing and living together under the same roof… and I’ve done everything for both of my bands successfully… In other words they really need me… At this moment, Hayagriva is still preparing for our forthcoming release… Just wait and see what is to come from Hayagriva!!! Yes, you’re right… I agree that I really can’t avoid the similarities in the vocals parts… Anyway, I’m trying my best to do it differently… the similarities is only in Eastern style… I mean, Hinduism and Buddhism roots… The differences is only in the concept and style… Purnamwulan is more into mythology and Hayagriva more into mother-nature… Both of them were universal… that’s all!!! “Seropoh Sombrong Mabhur”. Does this song is written in Java? What does it all about? Purnamwulan is very much linked to the moon. What the moon really means to you and in what way does the moon ‘eclipses’ Purnamwulan? If you really don’t know about Java races unique life-style… this is a little bit about it… An occult source have been sworning in the flowing blood of Java’s individual person and an enlightenment was given to it… So, the moon is the main ceremonial emblems to do with occult source of Javanese black magick… It’s the main subject and inspiration for Purnamwulan and we’ve come from this blood!!! I hope you’ll understand… What do you mean by ‘eclipses’? ‘Eclipses’ will ‘loosening the power’ of Us… That’s all!!! The story behind Java’s roots is the actual thing I’ve express in my lyricks… I’ve my own stand-point to write my lyricks… Let the myths, the legends and the cults of Java remains again and that’s what Purnamwulan exists for!!! Why don’t you sing all of your songs in pure Javanese language? Any specialities of a Purnamwulan live-shows? I think that gig in Ipoh on 2nd March ’97 is Purnamwulan’s first ever show, or am I wrong on this? As the other bands done on stage, we’ve done successfully… I guess, the specialities, we’re just wearing Purnamwulan ‘s ‘uniform’ in our action on stage and I’ve six times singing on stage… You’re really misunderstood cause this 2nd March is the third time we’ve done gigs by featuring our new line-up and this is the greatest for us!!! I can say that you’re not using any additional instruments on the “The Fullmoon Over the Kliwon” demo. Don’t you ever interested to use for example keyboards in your songs? What do you think about the eastern Metal scene right now? Anyway, be honest in what you’ve done!!! Do the right way to the eastern Metal tunes… eastern Metal is not for the stupids… Get an observation before you involve in these things… Actually, eastern Metal is only for eastern blackness spirits!!! How important is the band Purnamwulan to you. So what can we expect from Purnamwulan after the good demo? See what is to come for the forthcoming future time and it’s up to everyone should expect us… Behold, for ‘sheeps among the wolves’! aku dah letak random dlm blogroll aku.